FK talks to Evi from Bonnie Poplar about her new range of work being released at the upcoming Sydney markets. Tell us about your new label Bonnie Poplar. Bonnie Poplar is a creative factory that translates my illustrations onto objects. 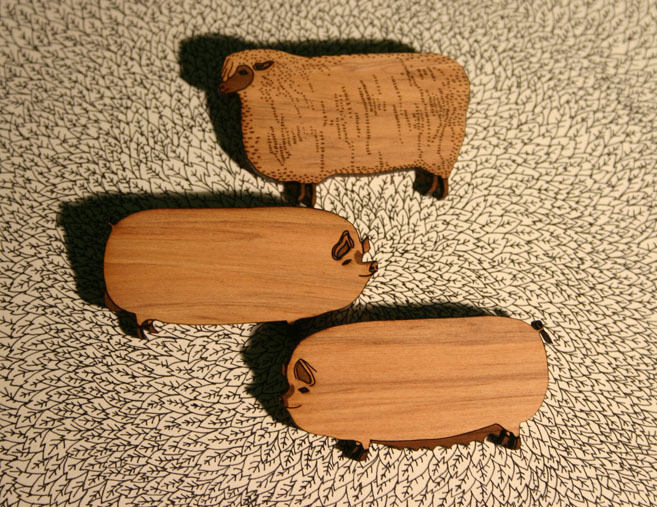 At the moment I’m obsessed with wooden brooches but I’m looking to keep experimenting on different materials and objects to give life and context to my illustrations. In this label I wish to create novelty objects with emotions, be them romantic as the pigeon brooch or comedy as in the gentlemen brooches. What is your background and what lead you to starting BP? I moved to Sydney in 2003 to study visual communication at UTS, and quickly develop deep love of book design, typography and illustration. After graduating, I wandered around freelancing as a graphic designer/illustrator for various studios, magazines and once in a while joined exhibitions such as Curvy. I also collaborated in a t-shirt label called More Often with my good mate Mark Soetantyo. Since early 2008, I belong to Penguin Books as a book designer and though it’s THE dream job to me, often I need other creative outlets, be it randomly doodling or sewing fabrics just to keep myself amused. Bonnie Poplar started as a leisure. I collect brooches and have always imagined how fun it would be to make them. Starting with just mad passion, pencil and paper, before I knew it there were my intricate drawings in forms of wooden brooches stuck onto my checked shirts. The name Bonnie Poplar itself came naturally after several rounds of trying to decide on a name, tough! It doesn’t mean anything in particular if you’re wondering, it just rings true to the product. What do you find inspiring in design and what fascinates you most? When seeing a lovely design, I’m always curious of the story behind it. What inspired the designer, why they create, what they created. To me, to design is almost like a journey in which the adventures in between are as interesting as the ending. I love to see how designers process and interpret their thoughts onto things that in the end inspire others, and there will be a new journey starting somewhere. What other artists/ designers do you admire? There is not one or few particular artists or designers I dearly admire, but certainly I love and appreciate a lot of designers and artists’ works. I have to say I admire ordinary things surrounding me, be them people, conversations, culture, books and movies. Those usually transform into some kind of inspirations to my work. Where would you most like to see your work? I’d love to see them treasured and nestling nicely on someone’s outfit, complimenting their looks or if lucky being that one centerpiece item. That’d be most satisfying to me as the creator. When you’re not creating, what are you spending your time doing? Hope this “Bonnie Poplar” will success and can produce more brooches or some more funky stuffs ;-). Excellent pieces of Art work! Welldone! cute simple and classy indeed!